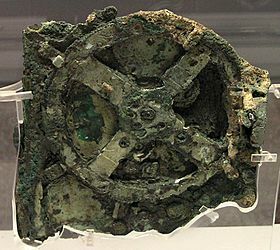 The Antikythera mechanism (main piece). Front panel of a 2007 reproduction. The device was found on a shipwreck, near the island Antikythera, between the Peloponnese and Crete. Different coins were also found on the wreck. There are coins from Pergamon, dating between 86BC and 67 BC, and coins from Ephesus, dating between 70 BC and 60 BC. This means that the ship sunk between 70 and 60 BC. This device is the most complex device known in Antiquity. Only in the 14th century did people have the knowledge to build similar devices. The device is now on display in the Bronze Collection of the National Archaeological Museum of Athens. When the mechanism was found, it consisted of corroded metal plates. Before x-rays could be used to show what was "inside", it was very difficult to judge what the mechanism did. Many of the parts that make up the mechanism were lost either during the roughly 2000 years it had laid on the sea floor, or shortly after discovery. Many gears have not "survived" in one piece. None of the scales is complete, and only one indicator survived as a fragment. 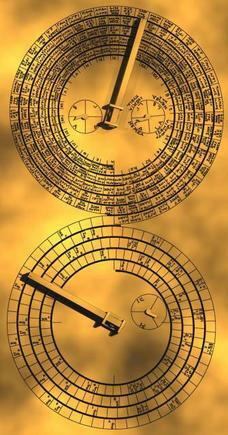 The Antikythera Research project has produced a reconstruction; it added seven gears that were probably part of the device. There are 35 gears, and seven displays. There are many hints that the device was also used to calculate and show the movement of stars, even though none of the necessary gears or displays have been found. There were 82 parts in total. With the parts found it is not possible to get the mechanism with all displays and dials fully operational. It is also not possible to know how many parts have been lost. In total, 30 gears were found. One gear is probably part of a planetary display, that has been lost. To make the reconstructed displays work, another eight gears would be necessary, but they have been lost. There are two crown gears, all the other gears found are normal gears (that require a special alignment of the axes). The gear was a primitive one, and the transmission was not uniform. The mechanism was repaired at least once, which shows that it must have been used often. A schematic representation of the gearing of the Antikythera Mechanism, including the 2012 published interpretation of existing gearing, gearing added to complete known functions, and proposed gearing to accomplish additional functions, namely true sun pointer and pointers for the five then-known planets, as proposed by Freeth and Jones, 2012. Based also upon similar drawing in the Freeth 2006 Supplement and Wright 2005, Epicycles Part 2. Proposed (as opposed to known from the artefact) gearing crosshatched. 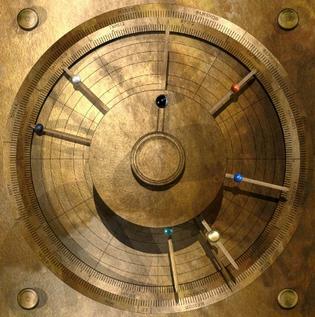 Antikythera mechanism Facts for Kids. Kiddle Encyclopedia.